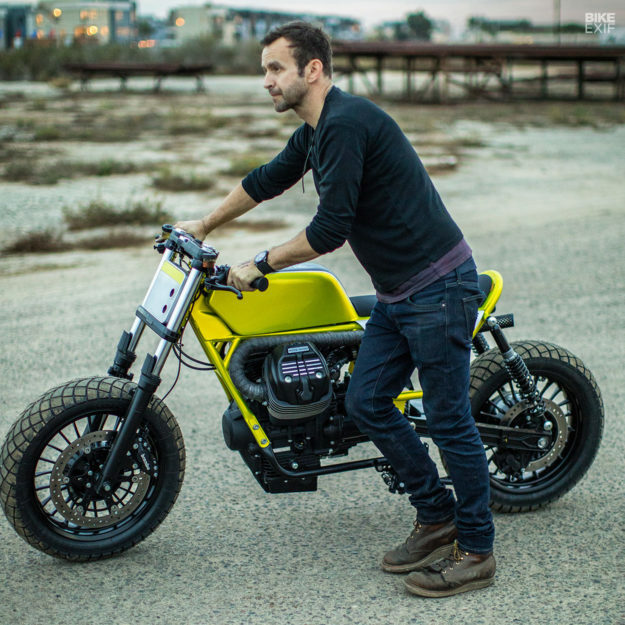 It’s been a busy year for Hugo Eccles of Untitled Motorcycles. 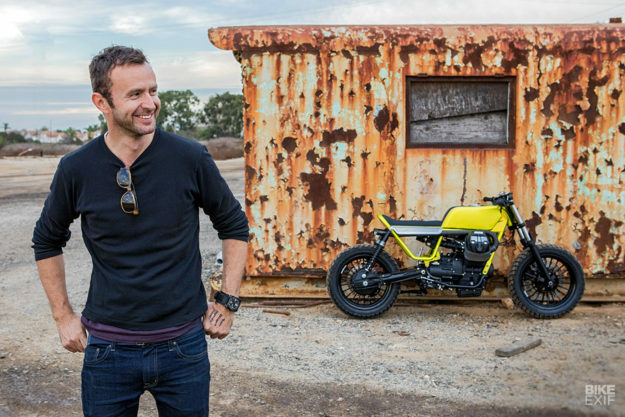 His Ducati Hyper Scrambler appeared on Jay Leno’s Garage, and his ‘Supernaturale’ Moto Guzzi custom won the coveted Design & Style award at the Quail Motorcycle Gathering this past June. 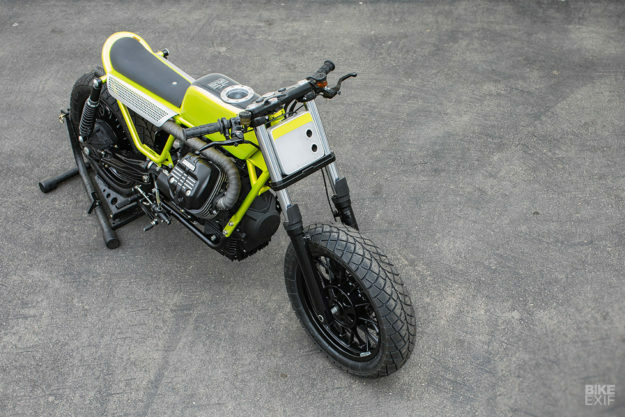 Moto Guzzi must have been paying attention because they recently commissioned Hugo to customize their V9 Bobber as part of their ‘Pro-Build’ program. 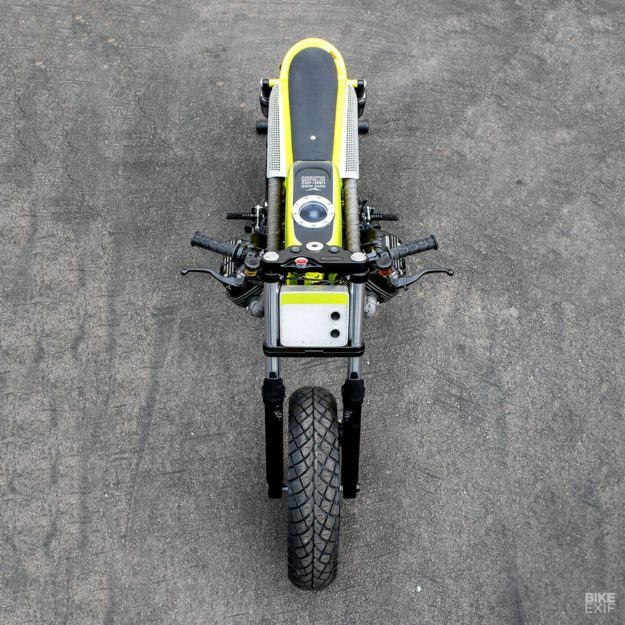 Untitled Motorcycles have an unusual cross-continent split: Hugo runs the San Francisco workshop, and Adam Kay the original London setup. 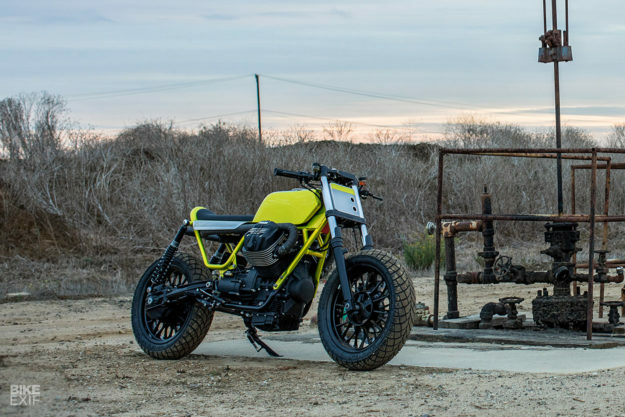 They’ve been around since 2010, and feature regularly on EXIF and in the original bible of the modern custom scene, The Ride. Hugo started by stripping the V9 Bobber down to the running chassis—frame, motor, and wheels—to see what lay underneath the panels. Identical 140/70-16 tires are fitted both front and rear, and are interchangeable—in keeping with the flat track theme. Hugo has cleaned up the V9’s frame, removing redundant brackets for the stock battery, airbox, and ABS. He’s also moved the rear suspension mounts forward an inch to accommodate longer Hagon 420mm (16.5″) shocks, and added a custom rear hoop to continue the flow of the frame and create a seat bump stop. 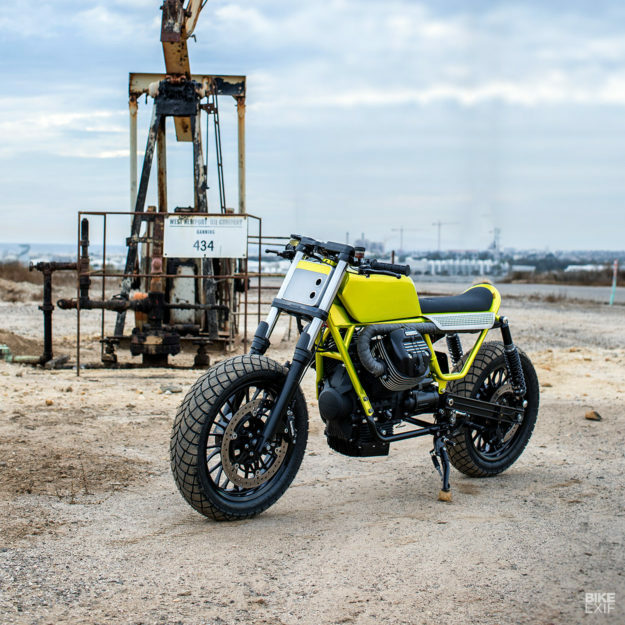 The Guzzi’s air-cooled 853cc motor is engineered for torque so it’s well suited to dirt. 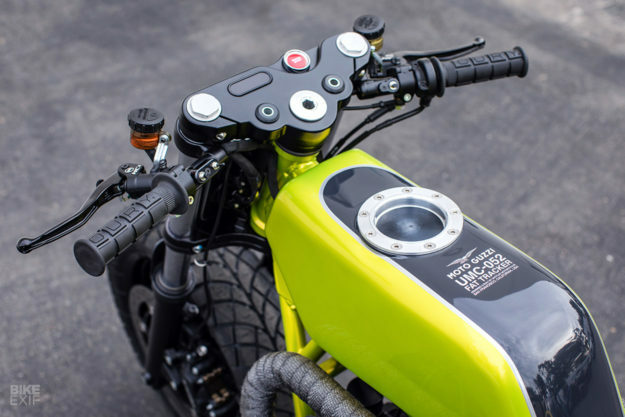 “I really liked the idea of creating a tension between the large transverse v-twin motor and a small body perched on top,” he says. 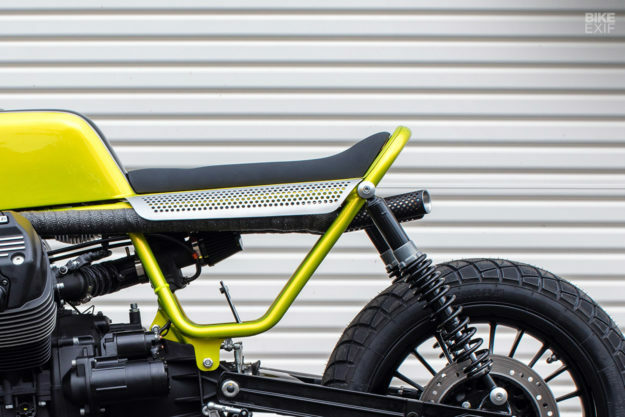 Hugo designed a chopped-down, super-slim monobody that contrasts with the width of the V-twin cylinders. It’s inspired by the 1960s Hanna-Barbera character Magilla Gorilla—a large ape with a tiny hat—and takes cues from the lines of the Guzzi’s frame. Diepenbroek used the original tank tunnel but ended up moving the side-mounted fuel pump, to keep the slim fuel tank design. A dry break receiver on top of the tank completes the flat track race look. 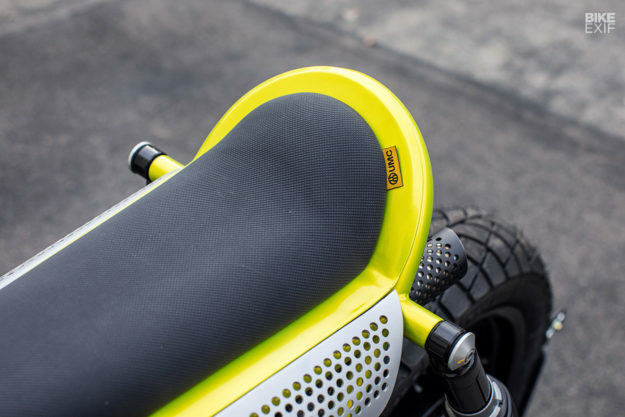 The fuel tank and seat blend together into a seamless monobody design topped with a narrow, vinyl-upholstered seat that matches the grey stripe on top of the tank. Aluminum heat shields, designed as part of the monobody, protect the rider’s legs from the exhaust. It’s a custom stainless steel system that runs over the top of the cylinders and inside the rear of the frame. Perforated exhaust tips mimic the heat shield’s hole pattern. The removable shields, built entirely by hand, were a task in themselves. “There are 438 holes. Each one was punched, piloted, drilled and reamed before being filed, sanded, sandblasted, and finally vapor blasted. That’s about 2,200 operations,” says Hugo. Hugo originally intended to copy that combination, but then changed his mind and decided to use green for the body and the frame. 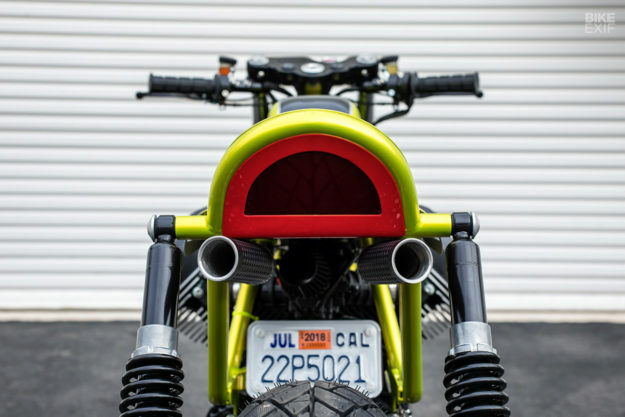 The bright red is now on the underside of the frame, and on the kicked up rear—where it integrates with a custom LED brake/blinker array designed with Motobox. “This was an opportunity to push the boundaries” says Motobox’s Josh Alvarez, who also built the DTRA-style front number plate. It’s got integrated turn signals and a pair of 500 lumen LED spotlights that perform as hi/lo-beams. Up front, there’s a full array of custom controls, including switchgear by Posh Factory, wired inside clip-on bars. “They’re modified Suzuki GSX-R handlebars, mount upside down and backwards, paired with Oury grips and Magura HC1 radial masters,” Hugo explains. 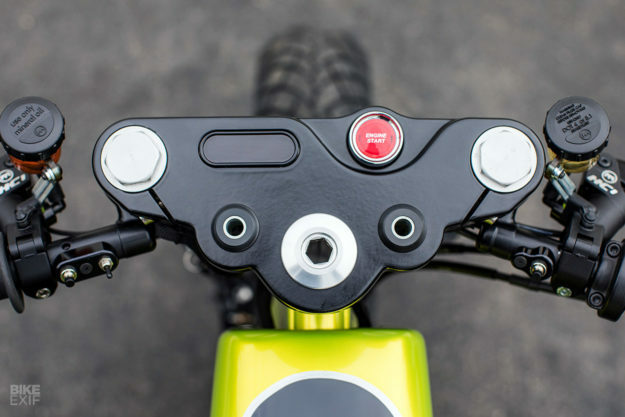 The stock top bracket was retained, but modified with a prominent start button replacing the original ignition block—and a tiny Motogadget LED display machined into the top surface. A Motogadget m.unit operates a keyless RFID module built into the seat. 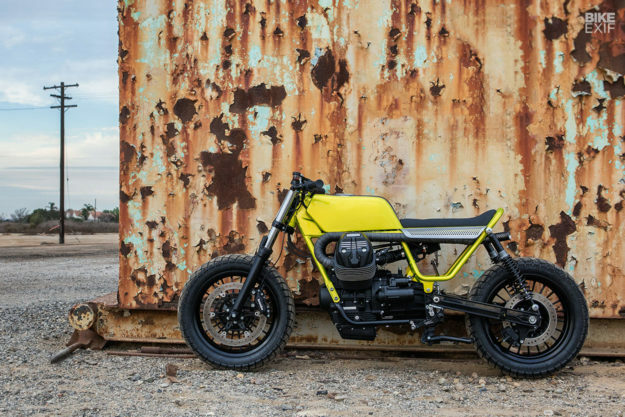 The pared-down, minimalist vibe makes this Guzzi V9 almost unrecognizable from—and 86lbs lighter than—the showroom bike. 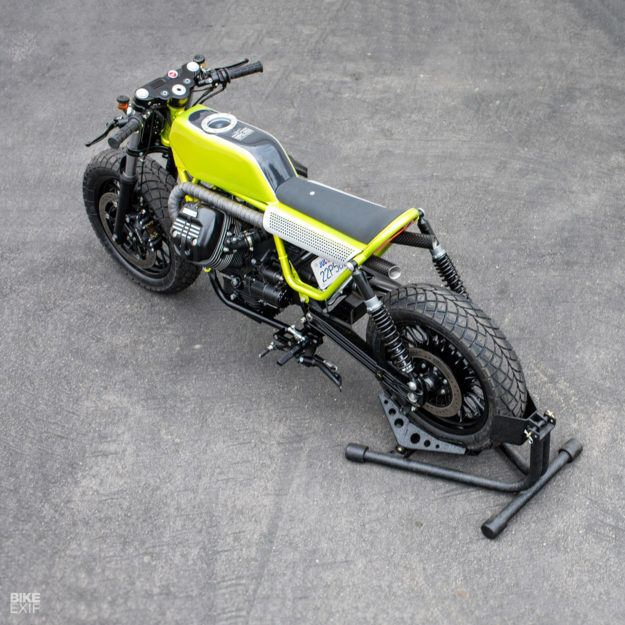 That seems to be typical of Hugo’s style, judging by his earlier Ducati Hyper Scrambler build. 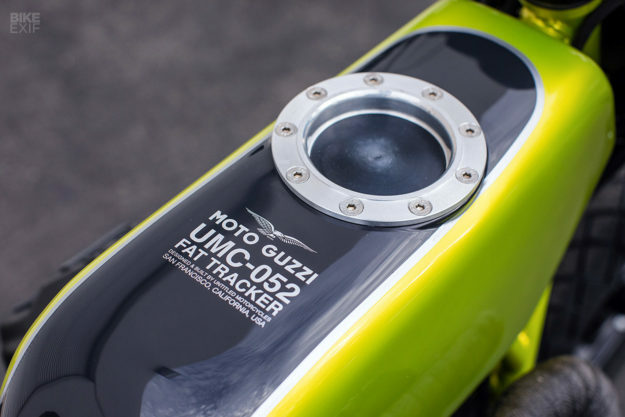 Untitled Motorcycles’ Fat Tracker is on the Moto Guzzi stand at the International Motorcycle Show at Long Beach California this weekend Friday 17th to Sunday 19th November.